Spartacus Legendary Warrior is 5 Reels and 50 Paylines video slot machine developed by Red 7 Gaming. The game is playable across every device including tablets, PCs and mobile phones with coin sizes of 25p per spin to £€100 per spin. The maximum win possible during this game is 250,000 coins on your stake. The game contains Bonus rounds wilds, expanded wilds, scatters, Multipliers, Free sins, Expanding Reels as well as Adjacent Pays. The expanding wilds of this Red 7 Spartacus Legendary Warrior Slot will turn 50 Paylines in to 100 Paylines. There are 5 reels with 10 rows of symbols exist in this game but during the base game only lower 5 rows are in active mode. To activate 100 Paylines, you just need to land a wild in the top half of the game and that happens very frequently so that you don’t get frustrated. Wilds and Expanded Wilds- The world ‘wild’ the wild symbol and it replaces all other symbols on your screen to form a winning combination for the 50 Payline game. But, if the ‘wild’ lands on the top section of the game then it will activate 100 payline game and winning would be more. Landing 3 or more scatters on screen will trigger one of three free spin bonuses and you would receive up to 12 free spins during this feature. 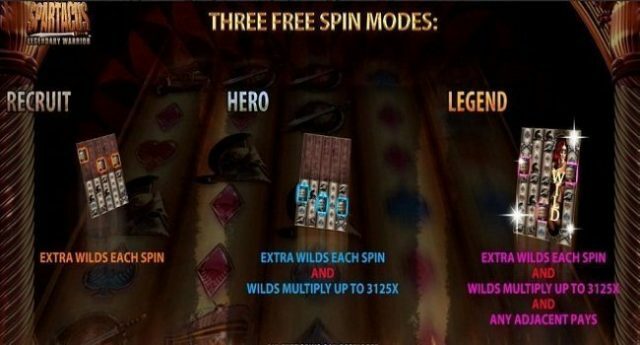 These free spins modes are Recruit, Hero and Legend. 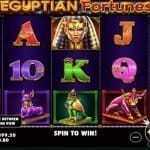 Recruit- During this feature you will get simple 12 free spins. 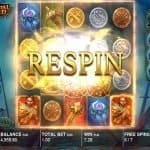 Hero- During this feature, you will get free spins along with 2x and or 5x multiplier. Legend Free spins- This feature is same as hero feature but symbols pay when they are adjacent. 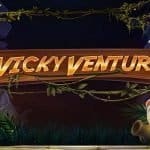 Spartacus Legendary Warrior Video slot is a very impressive slot machine powered by Red 7 Gaming which is one of a prominent iGaing company deals in making best online slots for internet players.